Produktinformationen "New Balance MF996MK Mid Cut Turf"
This mid cut turf shoe is constructed with an ABZORB heel and forefoot for shock absorption on the field. Lightweight speed shoe specifically designed to give the fastest player on the field a custom fit. ISS Internal Support System for additional stability. Stability Web delivers midfoot support and reduces the weight of the shoe. Nubbed rubber outsole for superior turf traction. 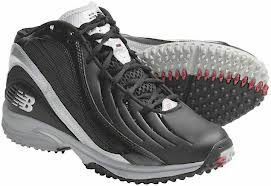 N-LOCK external support system ensures shoe is pulled snugly around your midfoot. D = regular width; 2E = wide. Produktbild dient der Veranschaulichung. Abweichungen sind möglich. Weiterführende Links zu "New Balance MF996MK Mid Cut Turf"
Kundenbewertungen für "New Balance MF996MK Mid Cut Turf"